I had some hard months but here I am! 2 years later I achieved a dream, to see the Taj Mahal. I have been into 11 countries this year, I sometimes travel alone, I feel confident during the night with my blind cane and I feel happy. I want to see the world but I am losing my sight due to Retinitis Pigmentosa (RP) so it is now or never, I choose now. Although I travel now, I believe I will find a way to enjoy trips in the future with little or non-sight. If I believe I can, I CAN! What I love most about Beatriz’s words is how they speak of going through loss and then the power of choice. It’s an important and timely universal message applicable to anyone. Life’s struggles will threaten to hold us back. However, when we choose to live life despite our struggles, we are able to move forward. The image is Blind Beauty’s faux fashion magazine cover. 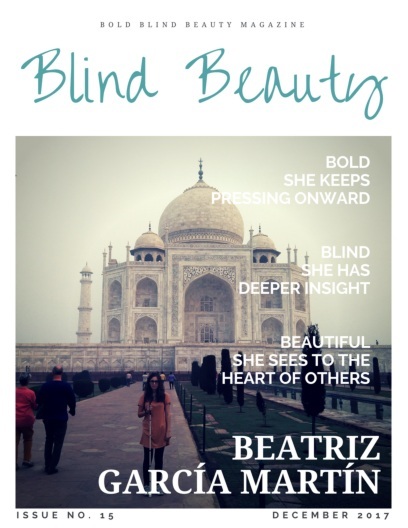 Beatriz is on the cover standing in front of the majestic Taj Mahal with her white cane. Beatriz travels to interesting places, and her photos are excellent. She is most gratuitous about sharing her experiences. I admire her for conquering her fear of flying to pursue traveling to such extraordinary places and I agree with you about how breathtaking her photos are.